Yesterday I showed you some BIG punkins. Today I want to show you where the little ones come from. This plant has quadrupled in size from when I first found it. And lots of little punkins are growing on it. They’re called Jack Be Little punkins. I love them. So get this, they’re not really on my property. The nasty squirrels or some birds must have deposited the seeds. But one of my neighbors came over and STARTED TO TAKE THEM ALL. Really? Go get your own!!!! If I see that again, I’m going to have to show them what a mad Scottie is like. And you know I can get me some mad. I’ll show you some more pictures of the plant and the punkins when I can. Right now, I gotta go give the mailman a piece of my mind. I’m feeling spunky today. But, just in case you’re interested in pumpkins, here’s some info. I AM SO HELPFUL!!! This entry was posted in The Scottie Chronicles and tagged autumn, dogs, fall, Jack Be Little Pumpkins, pets, plants, pumpkins, Scotties. Bookmark the permalink. Oh heck Stuart neighbors come on our property and pick our flowers all the time. Like they are to cheap to buy their flowers or to lazy to plant them. Oh, how nice of you to share your pumpkin patch with us today! Who knew Jack Be Little is the name for those little guys? Thanks for sharing the link – so many pumpkins, so little time! Seems you have a thing for ‘small things’ you know, like puppies…and pumpkins! You have me singing ‘It’s A Small, Small World”. You’re just the best, Stuart! How cool and rare is that? Pumpkins growing by a street sign! That is too cool! Hoping someone doesn’t rip the plant out entirely. We love pumpkins also. We tried growing them, but it is impossible. You can’t keep the bunnies out of them no matter how hard you try because the bunnies love them too. Not for the pumpkins, but they eat the entire plant right down to the soil line. You can’t shield pumpkin plants, they spread out. I know that the dogs could eliminate the bunnies, but the peeps don’t have the heart for that and would rather be without home-grown pumpkins. Kismet, we appreciate that your peeps have the big heart they have. Sorry, but we harvest our punkins before anybody BUT THE NEIGHBOR can get them. Y’all are good hearted souls. Those rascally pumpkin stealers! Opossums like pumpkins also don’t you know.Thanks for sharing your knowledge. We hope a couple are left for you to show us. That is so cool they are growing like that! Now go get that mailman, give him a “ruff” from us also. PUMPKINS !!! We ‘love’ pumpkin…we get it in our ‘dinner’ sometimes. 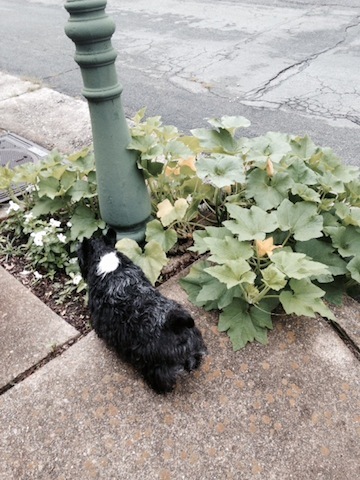 Hmmm, and you have your own plant under the lamp post….we better go check our light post . Perhaps a ‘pumpkin fairy’ planted one here too !! Keep that mailman on his toes Stuart ! Thank you for being so helpful, Stu! We really love punkins–probably ‘cuz we has to make believe it’s Autumn here ‘cuz we haz none! It only gets hotter here in da Fall–did you see about da bad fires near Napa? Now da fires are everywhere up as far as Alaska becuz of da 4 yr. drought up ‘n’ down da West Coast. So you is feelin Spunky, eh? Probably da punkin neighbor thief gots your juices boiling! Dat’s OK, it’s good to be Spunky!! Thanks again for da great info and lovely pictures! We own the lot next door to our house. The birds have filled the lot with tons of trees and plants. Oh, that is soooo cool!!!!! If those were in my hood, all the doggies peein’ on them would probably kill em’! BOL!!! You keeps those thieving peeps away! 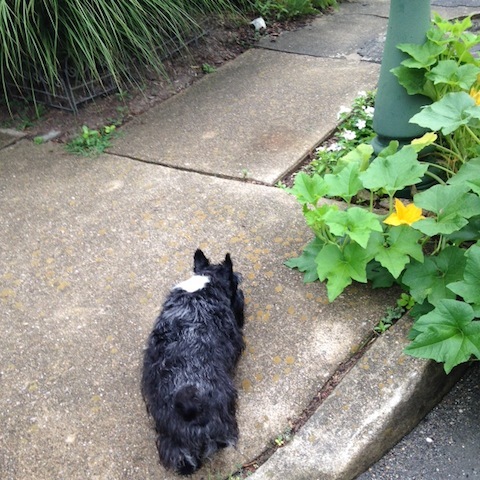 And gives the Mailpeeps a good bark from me too!